Angles of elevation and depression. Definition and examples. The angles of elevation and depression are two angles that are formed when an object is located above or below the observer's eye. 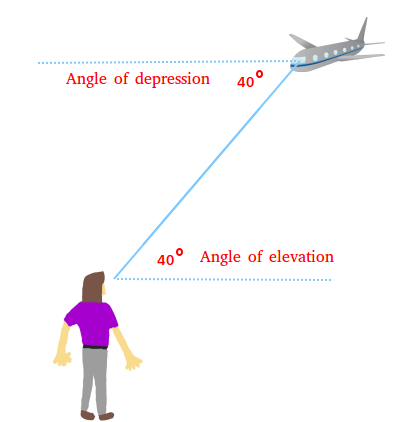 If the object is located above the observer's eye, the angle is called angle of elevation and if the object is located below the observer's eye, the angle is called angle of depression. For example., suppose a person on the ground sees an airplane at 40 degrees angle above the horizontal line. This angle is called angle of elevation. At the same time, the pilot in the cockpit sees the person on the ground at a 40 degrees angle below the horizontal line. This angle is called angle of depression.